My kids are a little older now, and don’t all like the same things anymore, if they ever did. I’ve learned the hard way that dragging all three of them on a family trip isn’t necessarily the way to go, unless we tailor the trip pretty extensively, or make it a vacation with few limits or rules. Since the second option is hard, and the first is a pain in the backside, I’m trying something a little different this year in between: shorter trips built around each kid. This has multiple benefits: it lets me focus, it lets them get extended individual time with me, and it makes sure that they’re not bored because I’ve dragged them all to the same destination without sufficient group consultation. Different interests, remember? This past weekend, Youngest and I went to Montreal. I paid way too much for a downtown hotel and we did the tourist thing in Old Montreal on Saturday, wondering around the funky shops, eating awesome food, and just having a good time. My French didn’t get too stressed as English is pretty common in Montreal, and she didn’t have to interact too closely with any strangers as I was there to run interference. Achievements unlocked: souvenirs, cool stuff, new food, new sights and sounds, French exposure, time with Dad. 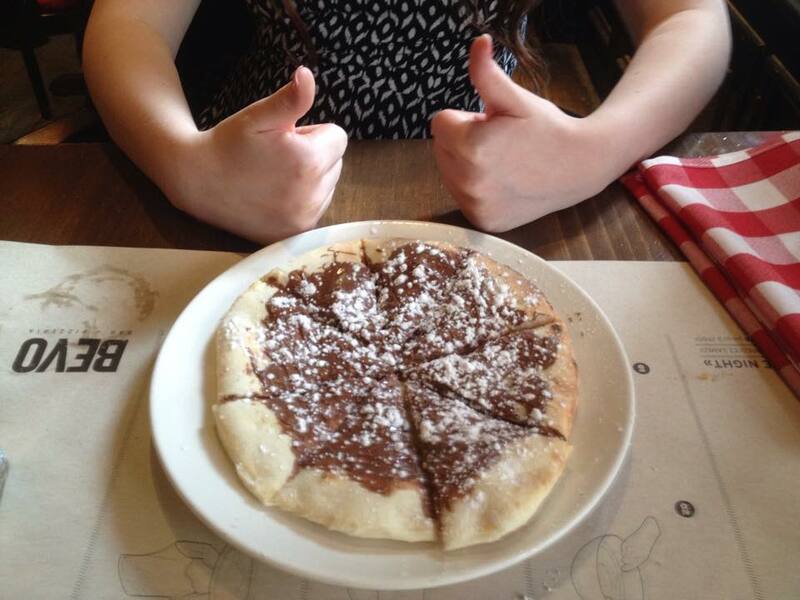 Oh, and Nutella Pizza. 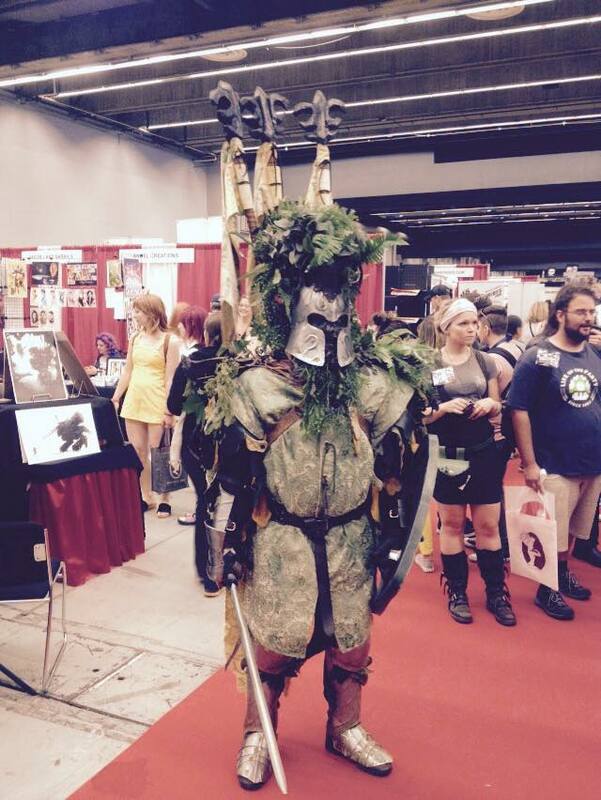 Sunday was for Montreal Comic Con. As an attendee on the con floor, I’m a little conventioned out these days. Most of the commercial stuff is the same from con to con and I like to spend more and more time in the indy area and artists’ alley to see the cool stuff, the different stuff. The commercial floor Montreal is a bit different as you get a few of the Francophone specialists who don’t go to Ottawa Comic Con in May, but not many. Youngest loves to shop, though not always to spend money, but she recognizes the sameness from con to con in the last couple of years. But it’s more about the guests anyway, right? And maybe the costumes? We only went to one Q&A of the two we planned (an extended and awesome breakfast got us to the con too late to catch Billie Piper again), but it was a good one. Karen Gillan and Caitlin Blackwood were really fun. Mostly Karen, to be honest. Ms. Blackwood is younger, hasn’t done a lot of acting beyond her part playing young Amy Pond on Dr. Who, and looked to be a bit overwhelmed by the fact that we’d all gathered around to listen to her answer questions. Karen took it in stride, but I think has done a number of big cons at this point, and tried to get her cousin (they’re related) to engage a little more, but it was tough. It’s a long drive home from Montreal, though, especially with no one to share the driving with, and we pulled into the driveway exhausted but satisfied, I think. I’m hoping she’ll want to do another road trip sometime soon, but it might not be overnight. Better if I don’t short her on sleep two days in a row, I think. A little later than I originally planned to get this up, but I’d like to state for the record that I want to go to more small conventions next year. Because Quinte Mini Con was a lot of low-stress fun. There was ample opportunity for geeky shopping for me, my wife, and the kids I brought with me (4, including 2 of my 3). Panels were all volunteer run and consisted of a selection of things the girls were actually into: Anime, webcomic, plus cosplay stuff for the cosplayers, an evil laugh contest, some retro gaming, and a couple of celebrity guests. Now before you get too limiting with your definition of celebrity, let me tell you who the celebrities were at QMC from my point of view. You can have your own definition and get upset at who I haven’t included who was on the guest list, but the beauty of any convention is that it isn’t all things to all people. Yes, there were some high end cosplayers there, too, but that’s not who I was there to see. John Stocker is a Canadian voice icon. 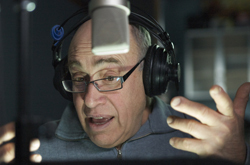 He’s got well over 100 show level voice acting credits and has done voices for such disparate shows as Franklin and Friends, Totally Spies, Mario Brothers, the Care Bears, Tripping the Rift, and Tintin. He’s the also a voice director (Sailor Moon, anyone? How about Mike the Knight, or maybe Fugget About It? ), and even spent a little time in front of the camera early in his career. I was able to spend a few minutes talking to him on the convention floor and he gave a great Q&A to an audience of a dozen or so. 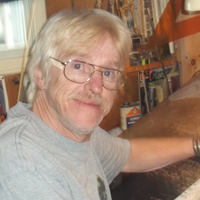 Dan Day is an artist who’s done work for both Marvel and DC in the comics world, as well as smaller publishers, and has a breadth of work in trading cards and gaming too, including Dragon Magazine, Magic the Gathering, and Steve Jackson Games. Dan was very friendly, very approachable, and also gave a fun Q&A to a small group. Actually, with the amount of time I spent talking to him during several visits to his table, I felt like I got a double Q&A. He also really needs a website, but he’s too busy drawing really spectacular stuff. The pressures at a bigger con would not have let me spend more than a few seconds talking to either of these two gentlemen, if I’d even been able to spend enough time in the right spots to see them. I like big cons, but there’s a lot to be said for a more personal touch. And being able to look around and see the whole floor at once offers a little extra freedom for the kids you have with you, depending on ages. Both of mine took advantage of that, and one of them surprising me a bit to do so. Plus, I was able to spend a lot of time with some good friends I don’t get to see very often. 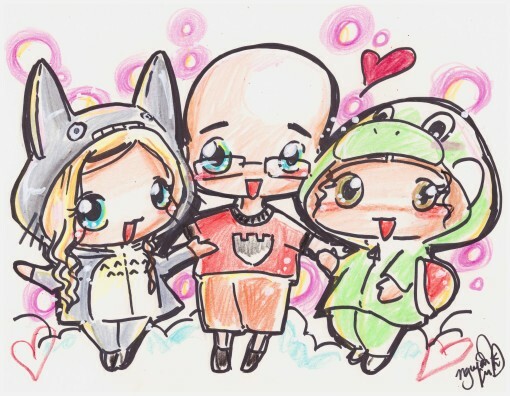 I’ll be honest, though, the highlight of the weekend for me was quite probably that my youngest daughter wanted to get Chibi-ized with her parents. This was done by the tremendously talented Kim Nguyen for a ridiculously low price. QMC is on my list every year that they want to run it. Last day of the con and had to pack up before we could go. This went well, and we still made it there before 1030, dropping right into the line up for Elijah Wood’s signing. And I got a lovely little sound bite. We also lined up for John Dimaggio, who, among many other things, is the voice of Jake the Dog on Adventure Time. I thought I got sound there, too, but my Zoom appears to have eaten it for the first time ever. More likely, I screwed up with the buttons. Missed the MLP panel, but spent time gaming with my son instead and found something we might like to play again. A little shopping, but not much, before the Elijah Wood panel, and I was a little surprised (and amused) by the number of F-bombs dropping from the gentle hobbit’s mouth. He was fun, but again not on stage nearly long enough. My son talked me into the ticketed event of Shatner and Stewart on stage. Funny that. My son talking me into something Star Trek related. But we went, and in spite of the mediocre seats (since there wasn’t as much time to line up as we would have liked after Mr. Wood’s Q&A) they were great. This session, at least, ran a little longer, though I felt like it zipped by. As I’ve said before, I don’t intend to ever miss an opportunity to hear a member of the original series crew speak if I can avoid it. I feel the same way about Sir Patrick Stewart as well, and I’m not too far off for the rest of Next Generation crew. Heck, if it’s Star Trek, I’m probably there. But now the con is over. I shouldn’t be as sad as I am considering how irritated at certain things I’ve been, but I am sad. And maybe it’s because I know I have no intention of going back next year. Not to this particular con, anyway. There are others. A more detailed report soon, and more pictures going up tonight. Lokai and Bele on the loose. A few more photos, but not as many as there might have been with my son and I in costume. A crowded day, but a good one, mostly. But I’ll get to that. Late to the con this morning due to how much time we spent on makeup. Hulk Hogan, who arrived a little late but spent a lot of time and care on his responses. Most of the Q&A was wrestling based, surprise, surprise. Managed to meet Garrik Hagon, who might be known best to geeks for playing Bigs Darklighter in the original Star Wars movie, but has almost 150 credits to his name. Nice fellow. Very personable. I’ve seen the whole floor now, I think, but maybe not in enough detail. One more day of potential shopping. A little line up confusion for Shatner, but wound up with pretty good seats for the thirty-minute Q&A. Yup, half an hour. He seemed a bit surprised when given a five-minute warning but covered it well, and was entertaining and active for the whole time he was on stage. But that might be the last straw between me and Fan Expo. It’s not the first super short panel this weekend, and now it seems like that’s the plan. Sorry guys, I know money makes the world go around, but there’s a limit to how much people are willing to put up with. You’re over mine now. I know I said that last year, but adding this on top makes us done until you bring the pendulum back. Tomorrow: Sailor Moon (maybe), My Little Pony, and Elijah Wood. Beyond that, we’ll see. All the photos I’ve uploaded so far here. More photos today, but it seems like I spent more time standing in line while I was at it. Fan Expo a little more crowded today. A few backups in the transit tube giving us a taste of what’s in store tomorrow. Ed Greenwood, who started his panel early (ten minutes before his moderator even got there), ran until they kicked us out of the room. The Dynamic Duo, Adam West and Burt Ward, were fun on stage together, but weren’t on stage nearly long enough. Less than forty minutes, in fact, and I wonder if there are health issues we’re not aware of. Hope everything is fine there. I’ve still probably only seen a third of the main floor of the convention, but detected a lot of things I want. Tomorrow: Hulk Hogan, William Shatner, hanging out with an old friend, and my son and I do a classic Star Trek cosplay. Didn’t take a lot of photos today, but I’ll probably make up for that tomorrow. So after having to wait an extra hour for our hotel room to be ready, we proceeded to have the worst underground parking lot experience of our lives. Four interconnected buildings (or maybe three?) each with their own P1, P2, and P3 levels, and each labelled identically. Signs and arrows that pointed everywhere, some of which were only for pedestrians but most of which were actually completely unlabelled and meaningless. Doors that only opened in one direction. Dead ends that appeared out of nowhere. But the con, when we finally got there, wasn’t too crowded, which was nice. Ray Park is tremendously entertaining and animated on stage. Got some good pictures, video, and audio. He’s also tremendously nice in person. Our cruising of the convention floor was cursory at best, hitting a few specifics, not finding a couple of others, and then checking out some of the video game demos. I’m particularly looking forward to Shadow of Mordor and Evolve. More cruising the floor tomorrow, Batman and Robin, Ed Greenwood, and I have to make a decision between Stan Lee and the Prisoners of Gravity reunion. One after the other, but in different buildings and no time in between. 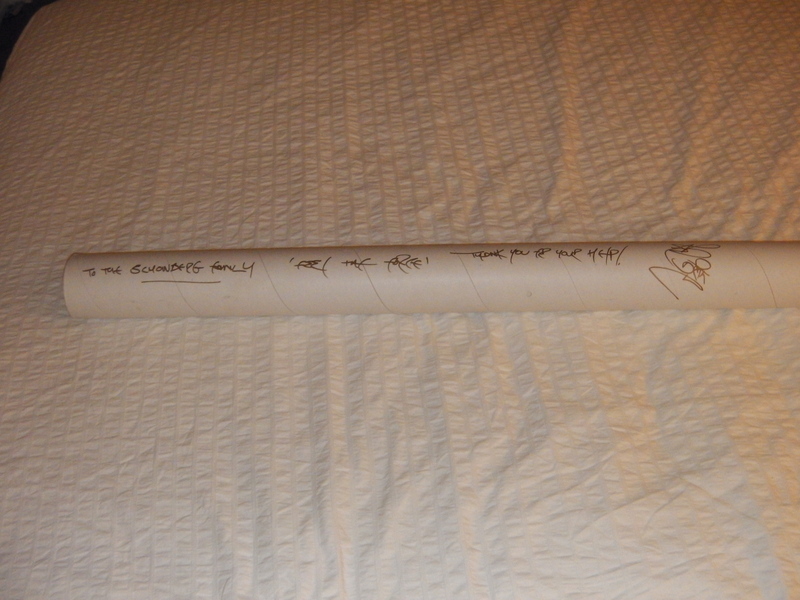 Oh, and the high point: the poster tube that substituted for a light saber for Darth Maul on stage. 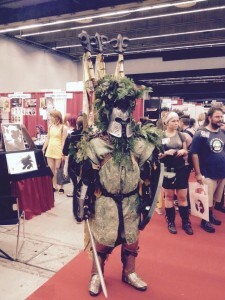 A few more pictures can be found in my Fan Expo 2014 Album on Facebook. So by now, you’re sick of hearing about Fan Expo and why I broke my promise to not go this year. Instead, this post is about cosplay. I made a suggestion to my family not too long ago, joking, mostly, about a potential group cosplay to do for a convention this year. 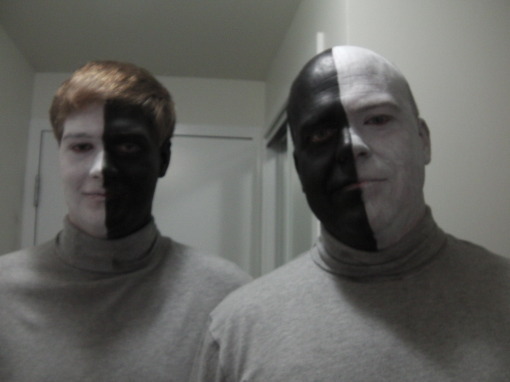 To preface that, Erik and I have been pretty seriously discussing doing the two half-black half-white aliens from an episode of classic Star Trek, “Let That Be Your Last Battlefield”, but I’m not sure how well it’s going to work. It’s barely 2 months before the convention, and we haven’t even looked at material or makeup. That needs to change, and very, very soon. But the group cosplay suggestion, which both daughters and my wife agreed to, the girls pretty much instantly, was that we would all dress up as My Little Ponies. Now, I don’t consider myself a Brony, though I do certainly ascribe to some of the more obvious general cultural tenets of the Brony movement. Friendship is magic, helping each other is cool, and it’s important to give a crap. Have I seen every single episode of Friendship Is Magic? Yeah, no. Have I seen some episodes? Absolutely. And while I personally find the writing predictable a lot of time, the stories are cute, and they play the emotions very well. The intended audience of young children, and not just girls, although it’s obvious they are the primary target, is well served by the show. The fact that it’s found a broader audience by being cute and clever, even if predictable, and warm and welcoming, is a good thing. So if I’m not a Brony, I respect the idea. And why would it bother me to dress up as one to entertain my daughters? The answer to that question is that it wouldn’t. There will be pictures. I’m sure there’ll be many pictures. Most of which will not be taken by me or any member of the family. That’s okay. I don’t care if they’re all over the internet, and if there’s a My Little Pony photo shoot on the day we pick that cosplay, awesome, because that will be an experience that none of us will ever forget. Experience is one of the most important things about life. If you spend all of your time grinding away at the same things day after day, with never a thought to the people and the world around you or your own personal growth and development, and life really is a waste. What I really want is for my kids to reach adulthood having had an awesome childhood, even better teen years, and to be fully prepared, well-rounded individuals ready to build their own place in society and their own families of awesomeness. I may have made mistakes along the way, and I wouldn’t be human if I hadn’t, but I like to think that things are working out pretty well when you look the big picture. I have three incredible kids, who, as I write this, are 15, 13, and 11. Every age has been my favorite for each of them, and I think that will continue for a while yet, but every chance I get, I want to give them something else awesome to remember. And if my dressing up as a My Little Pony works for that, I’m there. Of course, if we’re doing any cosplay for Fan Expo, we need to get started. No one really dressed up for Ottawa Comic Con, an only Erik bothered for Anime North and only for one day. He made his own costume to, a character from Deadman Wonderland, an anime I had never heard of until he started working the costume. But why did no one dress up? I blame myself for failing to get sufficiently excited by the idea. When I asked what people’s plans were, what they might be working on, I got lots of vague, noncommittal answers. I’ll call it a lesson learned. My Little pony idea has at least my daughters’ excited. Amanda is quite fond of the show, and Melanie loved the idea. Erik looked at me, arched an eyebrow, and walked away shaking his head. Not interested, but I’m not surprised. It’s certainly well below a 15-year-old boy’s dignity. I still hope he might change his mind. More generally, Fan Expo will be different. I’ve been trying to decide if I just how many of the four days I want to dress for and how many costumes. The ponies will be relatively easy to do. In fact, Amanda has a couple from last year we can probably add to for the girls, just needing completely fresh ones for my wife and me. If I can get my son’s excitement level up, we’ve got Lokai and Bele for another day. This could be a fun cosplay, probably a first day of the convention cosplay because Erik and I have even toyed with the idea of chasing each other through the con while wearing them. But can I do more? Should I? I have some ideas, most of them, unsurprisingly, accounting from classic trek. A couple those of are easy, just costing a few dollars, but a few dollars are harder to come by than a few minutes or hours of time. Financially speaking, it might be better to try to make costumes. I had been considering the idea of Business Gorn, which seems less attractive now that I’ve seen TuxedoVader. But the basic idea was a Gorn mask, the hand and foot accoutrements for a giant lizard, and wearing one of my lighter suits. Tuck the mask in and wear a tie and I probably wouldn’t even need the body paint the backup. I also thought of stealing a couple of costume ideas from the episode a mock time. Vulcan ears aren’t too difficult, though robes might be a little harder, though I have some thoughts on where I could get them. A Vulcan priest might be a lot of fun, but I don’t know if I have that much free time between now and then. Of course, there the ears with a classic blue starship uniform, a prop or two to make an easy Starfleet officer. Not Spock, per se, because I don’t have the hair for it, but surely he wasn’t the only Vulcan who ever enlisted Starfleet. I thought an Andorian might be fun to. The challenge would be the antenna. Blue face paint is probably not too difficult, as long as you buy decent grade stuff. Again, it comes into the idea time to make the costume. And my sewing skills are not the greatest. Who am I kidding? My sewing skills are negligible. But I do already have a costume in the can that has nothing to do with Star Trek, pulling out my Professor Stein costume from Anime North last year, our group cosplay. Doing that, Mel might dig out her Maka jacket and repair the scythe that is currently in two pieces in her room. I do need to give it a little more thought, and don’t know if I need to dress up every single day. Especially not if I’m the only one of my family who does. I do have a preference for group costumes if I I can get some of the other members of the family to participate and failing that, anything Star Trek is fair game. And if I’m willing to expand which series I’m looking at for aliens, there is a lot of selection over 700 plus episodes of Trek.Plenty of aliens available, but again it all comes down to time and skill. And participation for my family. But we should have one group cosplay in the bag at least . Beyond that, well, we’ll see. Okay, so as we all figured out yesterday, I’ve given in and allowed myself to be seduced by Fan Expo one more time. While they don’t appear to be making a big deal about it being Fan Expo 20, at least not yet, they are, as I suspected pulling out all the stops to get my money. Witness for the defense, a partial guest list. Okay, the last two are real names, but even if you know Richard Dreyfuss from Close Encounters and Jaws, he’s done a tremendous collection of non-genre stuff that he’s far more well known for, I think. And Stan Lee is Stan Lee. This list also doesn’t touch on Anime or Gaming at all, but if I get to see all of these people speak, I’ll have won the con. Eleven sesssion, as long as they’re spread across four day and not crammed into one or two. I also notice the disappearance of the sports section on the web site, which means they will put other stuff where that used to be, and that makes me happy. [As a side note, it probably makes the sports vendors from last year happy, too, because I don’t think they did a great deal of business. They were just a space for the geeks to walk through to get to the stuff we actually care about. But that would not have been fair to my family. Montréal looks like a Star Trek: The Next Generation Fest. Awesome for me with Riker, Data, Dr. Crusher, Counselor Troy, Worf, Laforge, plus Tasha and Q all in one place. And yet Fan Expo wins the battle for a peaceful, family trip. There’s just too much a variety, too many different types of guests that appeal to more members of my family. Well, and me, but not just me. Montréal is a Star Trek best, then expose a family trip. You should not leave the convention center on Saturday, because they will get more than the number of people they are allowed to have inside the building who want to be inside the building. Last year, my wife got stuck outside for two hours having gone back to the hotel room with our youngest to avoid con lunch again. Saturday is stupid crowded. Plan Saturday meticulously, leaving giant safety margins. My son almost missed our photo op with George Takei last year because he couldn’t get from the South building to the north in less than 40 minutes. Friday is busy, and also needs careful planning. You don’t need quite the safety margins as you do for Saturday, but they’re still important. Do your primary window shopping on the convention floor on Thursday. Thursday is the quietest day that provides the most freedom of movement and the fewest delays. Of course, it also provides the best opportunity to sit up front for a celebrity session. Do your primary actual shopping on Sunday. This is when the deals come out, and unless you found something truly one-of-a-kind on Thursday when you first looked, there is a chance, if not a large one, that it might be cheaper on Sunday. Plus, the fewer things you buy before Sunday, the fewer things you have to store in the hotel room for the weekend. Just don’t forget to make notes about where the things that you want are when you’re window shopping on Thursday. The convention floor is huge. And yet, I still hear the call of Montréal. The gathering of so much TNG geekness in one place is almost more than I can take. I resisted a similar convergence, though it missed Q & Tasha and included Picard (who is the only one who hasn’t been announced for Montréal this year, though I remain hopeful) only because I had to work that weekend, and was out of vacation time because of a tropical trip we were about to take. Of course, if I’m honest, as soon as fan Expo announced William Shatner, the battle was lost. I have made a non-binding commitment to myself that I will not miss an opportunity to hear one of the original series cast members speak as long as they continue to do the convention circuit. And, having enjoyed Leonard Nimoy via Skype in Ottawa, and having heard in say that he had signed a contract to do seven such appearances, only four of which I’ve been able to track down so far, I wonder if Fan Expo will try to pull a rabbit out of the hat and have Leonard Nimoy on Skype while William Shatner is on stage. I doubt it, but I’d never forgive myself or missing it if it did happen. 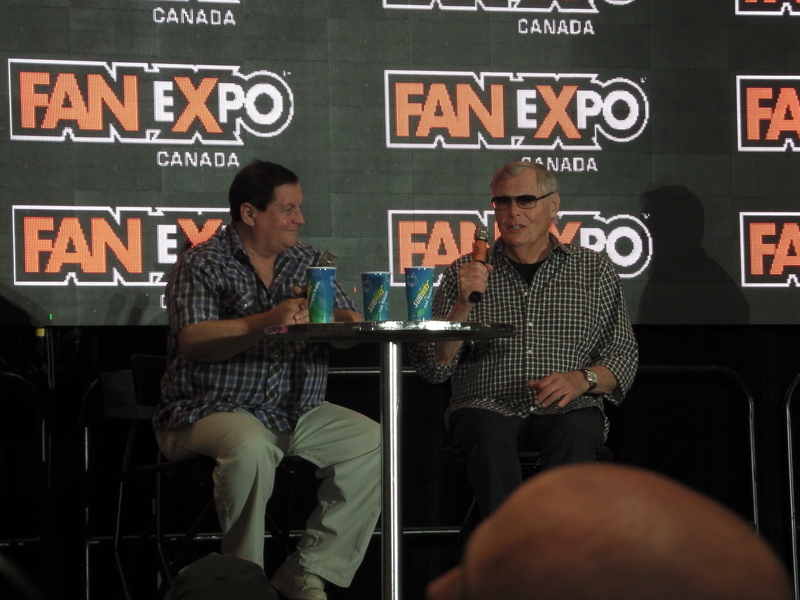 I miss them actually on stage together in 2006, well before Erik and I started being interested in conventions, and I know I missed Mr. Nimoy’s last appearance at Fan Expo in 2009. I try not to look too closely at previous guest lists for conventions that happened when we were living in Toronto, telling myself I was young (well younger) and had other concerns at the time. But I still hear the call of Montréal. If I can find a way to make the budget work for a day trip, and a day trip to Montréal is rough physically from where we live, I will find a way. It may depend on how many members of my family want to go with me, but we’ll deal with that when it comes to figuring it out. The budget for conventions this year (and otherwise) is already stressed, however, because we didn’t originally plan to do the full weekend of Ottawa Comic con. The original thought was to do it for one day and take my mom, but the guest list didn’t appeal to her all that much, and we had friends going, and so we eventually decided to go anyway even though we’d bought the tickets months in advance for Anime North. And, we weren’t missing that one. In many ways, it’s the kids favorite con. But, I’m climbing back in the bed with Fan Expo this year, after I promised myself I wouldn’t. It’s like a bad relationship, it really is. Even taking into account the crazy lack of organization and traffic control, the huge crowds stressing me out, and the staggering hotel bills, all of which seem to get worse every single year, there’s one thing I have to admit: Fan Expo gives good geek.